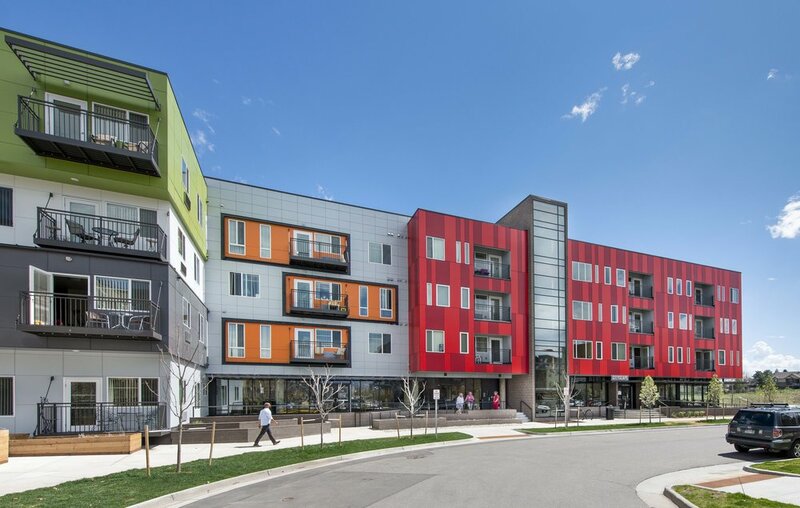 This 4-story senior housing project is intended to encourage dynamic living and activity for today’s active senior population through numerous innovative design features. One such feature incorporated is an architecturally significant “Health Stair” designed to encourage resident use for activity and fitness. The building configuration is a south facing ‘C’ shaped courtyard with a 3 story single unit projection off the South end, while the East building wing is lowered by one story to maximize light and views to the wet land detention pond beyond. The southwest portion of the building contains a transparent storefront grade level amenity area with several access points to the main entry, southern plaza and internal courtyard. A solar awning wraps the southern façade and provides shade for an adjacent plaza. The project includes a total of 130 units, 96 of which are income-restricted while 33 are market-rate. Many interior/exterior amenities have been designed for a high level of living. Courtyard amenities include in-built in grill and gas fire pit, privacy screens at courtyard unit entries with personalized raised planters and a suspended central shade structure. An accessible roof top garden as well as a courtyard community garden is planned for the enjoyment of the residents. The exterior massing is broken down with a rain screen panel system, cement fiber panels siding, and a metal panel system with shadow boxes to create interest and scale on the facade. The amenity wing is also rich in interior amenities such as main community room with wrap around glazing, community kitchen, fitness and flex room and billiards room to name a few.